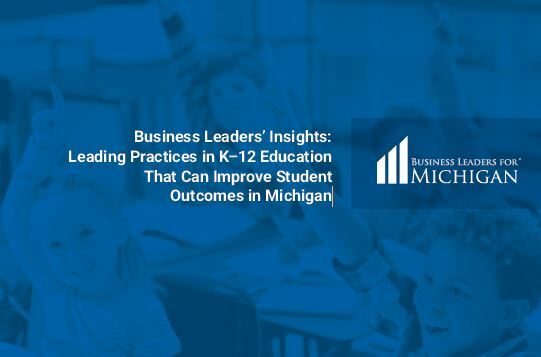 Business Leaders for Michigan (BLM) issued its review of best practices in K–12 education and a set of principles that can lead to better student performance, with the goal of making Michigan one of the nation’s top 10 states for student learning and talent development. BLM leaders say the report, Business Leaders’ Insights: Leading Practices in K-12 Education that Can Improve Student Outcomes in Michigan, is aimed at prompting an important public dialogue that leads to effective fixes for the state’s poor student outcomes. Research and analysis for the report was conducted by PwC in collaboration with Business Leaders for Michigan. The data presented in this report come from several sources, most of which is publicly available.